Audaxes are long distance rides over a pre-determined course, but without the hype (or cost) of the modern day sportives. Riders complete the course unsupported, save for the support of their fellow riders passing through a number of checkpoints on the way. Whilst riders do aim to complete the course as quickly as possible, it isn’t a race. 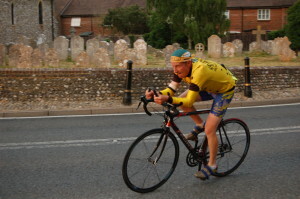 Audax distances are generally from 100Km and upwards – 200Km (124 miles) being a popular distance. The short(!) rides are generally completed within the day whilst the longer ones – 400/600/1200Km take place over several days – riders carrying the kit (lights, clothing & sometimes sleeping bags) they will need during the ride. Sleeping does take place, just short naps to recover before getting back on to do the rest of the ride. Audax UK lists many organised Audaxes run in the UK and we have a few members who Audax regularly – if you’re interested then get in touch!